These days, it seems travelers take their dogs everywhere. Whether they’re in the back seat with their heads hanging out the window or they’re tucked into a shoulder bag, man’s best friend is being welcomed into tourist spots all over the country. Carmel is brimming with pet-friendly places to go. Inns, hotels, restaurants and shops around town welcome pets with water dishes and biscuits, and many Carmel restaurants offer a 'pet menu' and private areas to dine with family friends without encroaching on non-dog-loving patrons. 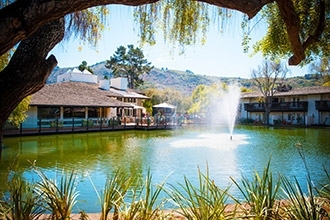 Among these pet-friendly destinations in Carmel is the Cypress Inn (Doris Day's place), which provides great pet accommodations, treats and even a daily Doggie Cocktail Hour in the bar. For daytime activities, the Carmel Plaza is a conveniently located shopping area right on Carmel's Ocean Avenue. The Plaza's "Fountain of Woof," which is ready for dogs to enjoy, provides a running stream of fresh water for the beautiful flowers and plants that landscape this wonderful center. There are also several pet-friendly beaches in Carmel where owners can relax while their dogs play in the sand and surf. If traveling with a four-legged companion, just be sure to pick up one of the free village 'doggie bags' to help keep the streets of Carmel waste-free. Pet owners seeking a unique way to remember their adventure in Carmel will find that there are also many Carmel artists and galleries that will paint or photograph their dog or cat. When booking reservations at one of Carmel’s pet-friendly hotels, inns or cottages, travelers should be sure to ask about these services and locations.